Define Bottle Review: Fruit-Infused Water to Go! Tasty — and pretty — water to go. You know the water you get at spas? The ones infused with lemon, lime or berries of every variety? The stuff that tastes so darn good and refreshing? Well, every time I have it, I think: Why don’t I make this for myself at home? And then I do, but either the whole pitcher doesn’t get drank and it gets kind of funky on day No. 2, or I put a few lemon slices in my water bottle, but they float to the top and the seeds get in the way and just, argh, not a spa-like experience at all. So when 14-year-old Carter Kostler emailed us, asking us to review his new invention the Define Bottle, we couldn’t say no. First, a 14-year-old designing a product to make people healthier? Hells to the yes. (Go, Carter!) Second, the whole point of the Define Bottle is to give you that spa-like, fruit-infused water experience no matter where you go. Brilliant. Third, just look at the bottle above! So pretty! And there’s no doubt that the design of the Define Bottle is cool. With a bamboo lid, a separate section to keep your fruit (it has a filter, so it never floats up and gets in your way) and made of materials that are free of BPA, phosphate, estrogenic activity and androgenic activity, this water bottle is even easy to clean (you can put everything but the bamboo top in the dishwasher). I stuffed mine with watermelon and mint one day, lemons and lime the next, and then strawberries and spearmint. 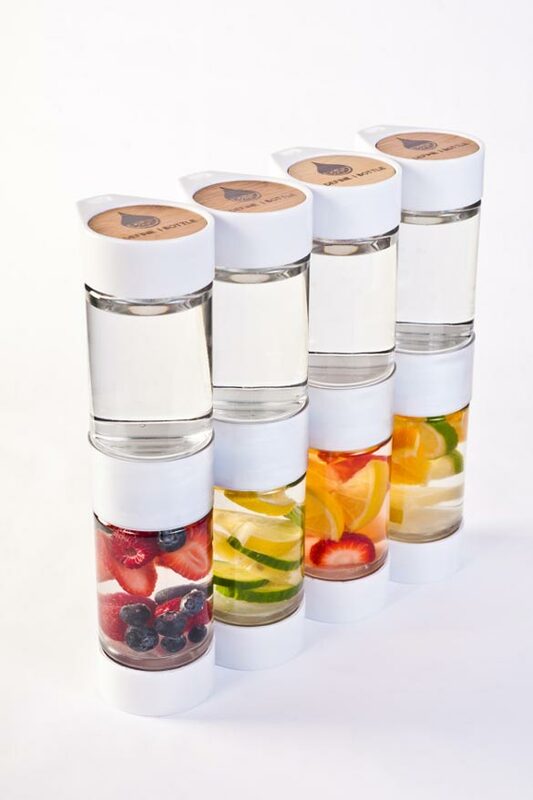 The water-infusing options are endlessly delicious! And the design kind of reminds me of the GoStak, which we think is pretty amazing. That said, a few things to note. The Define Bottle doesn’t hold that much water (I’m like a camel! ), so while it’s good for running a few errands, you’d need to do lots of refilling if you were taking it to work all day. Also, you have to clean your bottle REALLY well before using it. This is normal for all water bottles, but I’ve never had one that smelled so much like plastic when you first took it out of its packaging. Like we said, it’s free of BPA and all that jazz, but man, that smell killed my fruit-infused water buzz and took some scrubbing to get out. Lastly, while the bamboo lid is gorgeous, if you get it even the least bit wet it discolors. Not the end of the world, but since it is a water bottle, it’s almost impossible to always keep it dry. But we have nothing but love for Carter. Talk about a brilliant healthy rock star with an amazing concept and beautiful product! We expect more amazing things from you, bud! I love the design of these bottles! I too love drinking fruit infused water, but hate the dealing with the problems you mentioned! Where can I buy the Define Bottle online to be shipped safely to Malaysia? Please email me all the details?